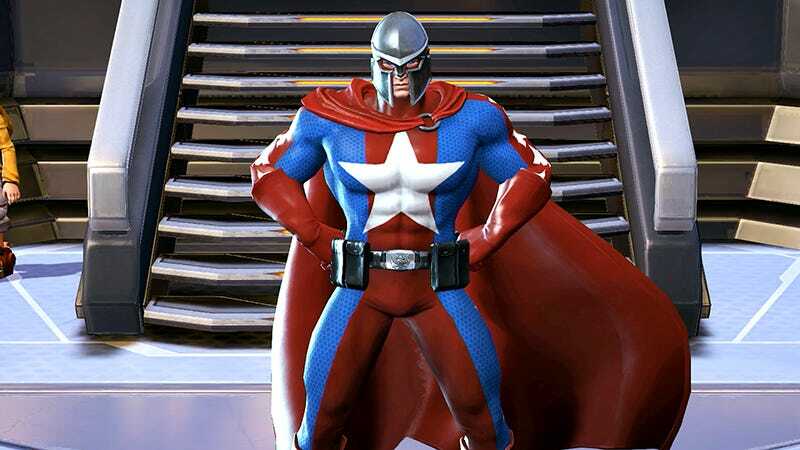 As if killing off City of Heroes back in 2012 wasn’t bad enough, now NCsoft takes one of the dead superhero MMO’s most beloved characters, Statesman, and pits him against characters from more successful games, less cancelled games as the latest champion in PC MOBA Master X Master. Homage is nice. A nod now and then would be great. Making Statesman, once the proud face of City of Heroes, fight in an arena against a collection of original creations and characters from Blade and Soul, WildStar, Guild Wars 2 and Lineage verges on insulting. I’m not saying Master X Master (MXM) isn’t a good game. I’ve not had a chance to play it, so I couldn’t say. It’s just sad to see Statesman alone so far from his Paragon City home. He should be surrounded by colorful player-created characters with horrible names, not fighting for our amusement in some sort of contest of champions. Statesman will be showing off his damage mitigating skills during MXM’s upcoming public closed beta, which runs April 6th through the 27th. Poor guy.